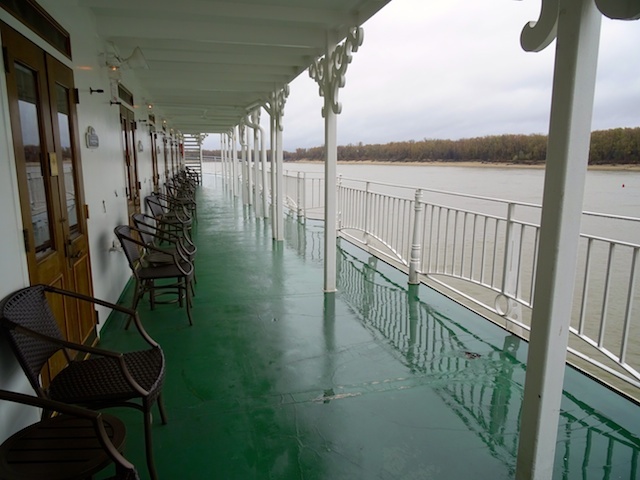 In November we visited USA and part of our trip included a cruise on the American Queen Steamboat down the Mississippi from Memphis to New Orleans. 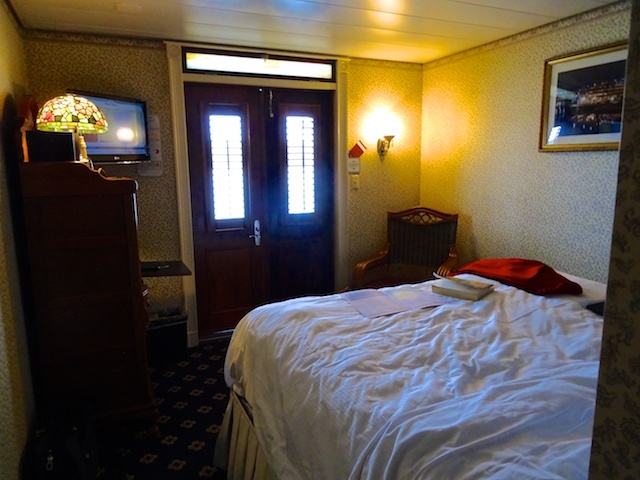 We checked in at the Sheraton Hotel for the cruise and we were able to board at 3:00pm. Kathy, Rob, Bill and I caught a bus to the wharf and excitedly walked over the gangway. It was fun finding our cabins and our way around the boat. We were disappointed to find that our cabins were not near each other even though we asked for adjoining cabins and we were allocated 438 and 439. However, the even numbers were on one side of the boat and the odd numbers were on the other side. Oh well, not a problem. 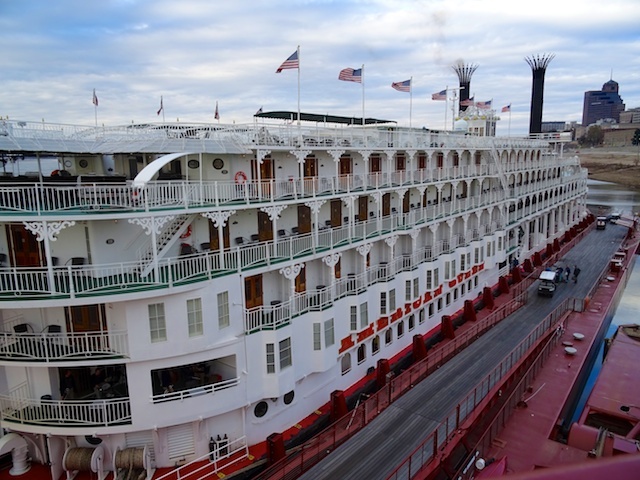 The American Queen is said to be the largest river steamboat ever built. 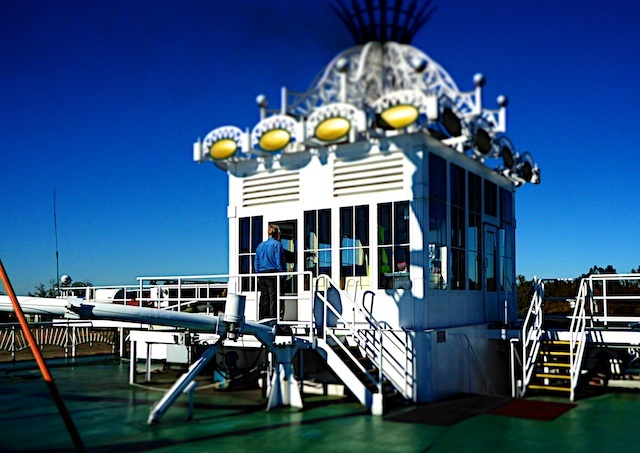 She was built in 1995 and is a six-deck recreation of a classic Mississippi riverboat. She has 222 cabins for a capacity of 436 guests and a crew of 160. She is 127m long and 27 metres wide. It has a steam engine to drive the paddlewheel. 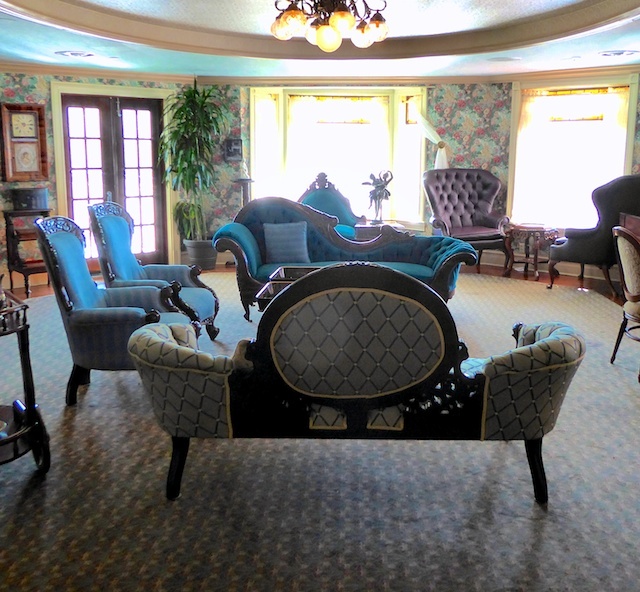 There is a Front Porch cafe serving food all day and the J M White Dining Room where guests dine nightly in two shifts. 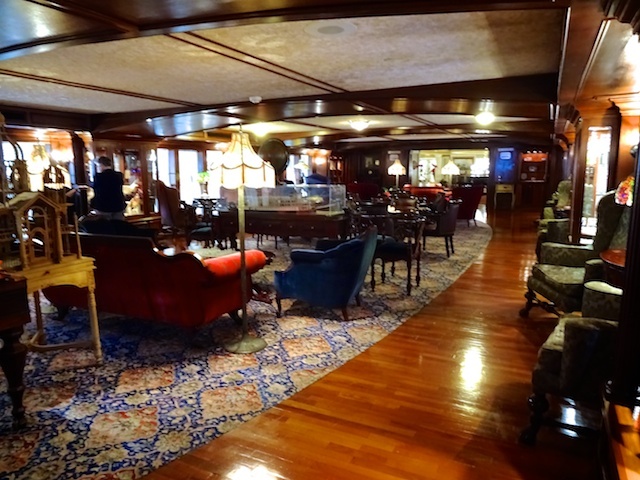 There is a River Grill & Bar and a Grand Saloon for evening entertainment as well as lounges, reading rooms, spa and gym. 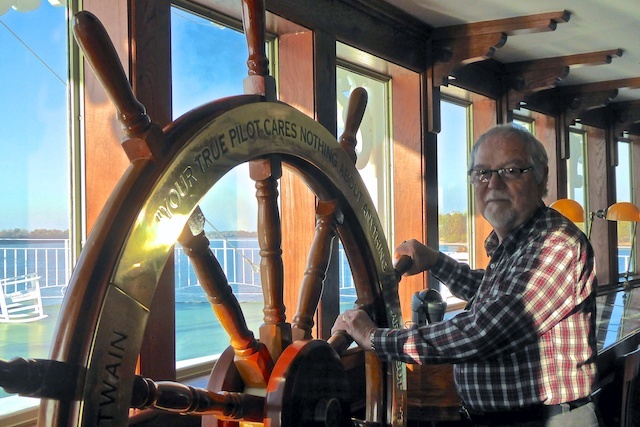 It carries on the tradition of the elegant 19th century steamboat travel. Our cabin opened onto the deck where there were chairs for us to lounge in, however the weather wasn't the best at first. Cold and wet. 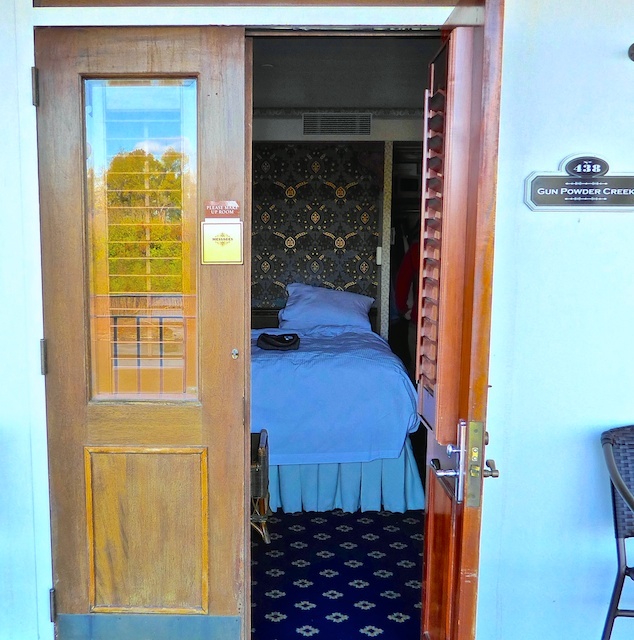 The cabin was quite roomy for a river cruise boat. The problem was that the walls were not sound proof and we could hear the neighbours talking and their TV. We had to buy earplugs so we could sleep. 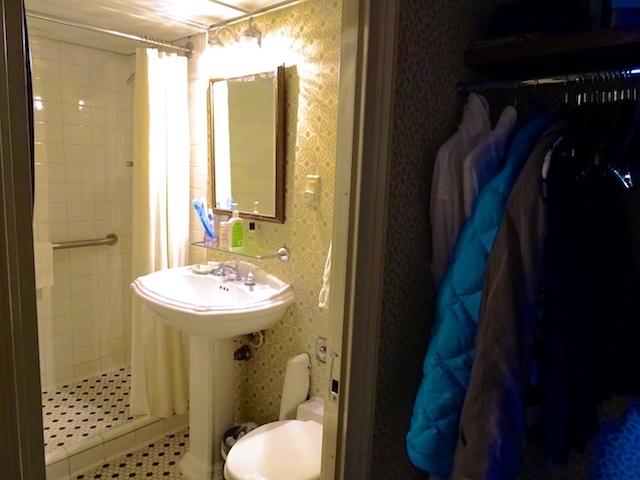 The bathroom was much bigger than on other river boats I have been on. 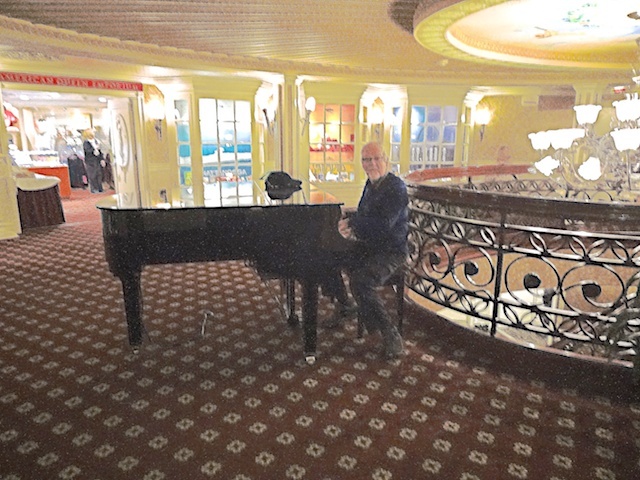 Bill tickled the ivories of the grand piano in the area outside the purser's office. Behind him is the shop. The lounge was a place where we tried to use the free WiFi but it was a joke. It was so slow and intermittent that it was almost impossible to use. So my blogging came to a halt. There was a ladies and a separate gents reading room but no one took any notice of the signs and both sexes sat in both rooms. I liked the gents room because it had puzzles and games in it. The dining room was very nice. 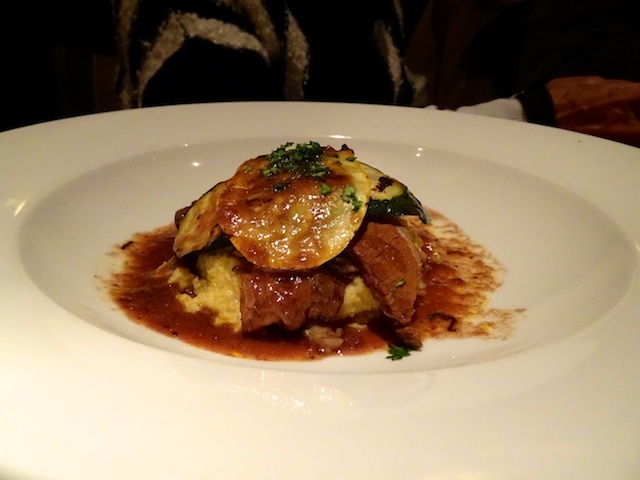 The food was sensational and the staff very pleasant, friendly and helpful. 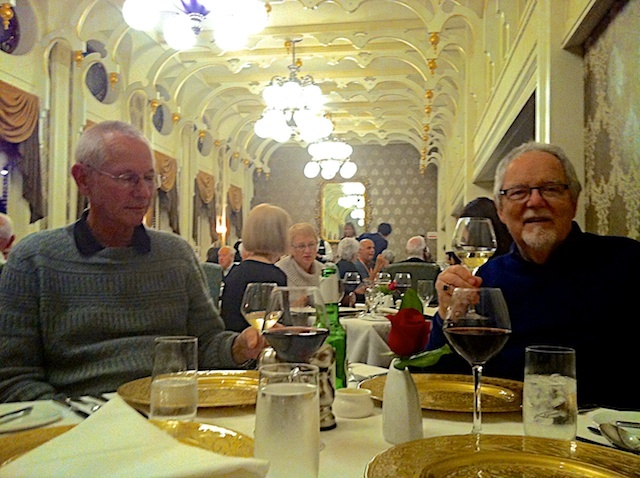 After dinner we would go to the Grand saloon to see a show. The shows were quite entertaining. 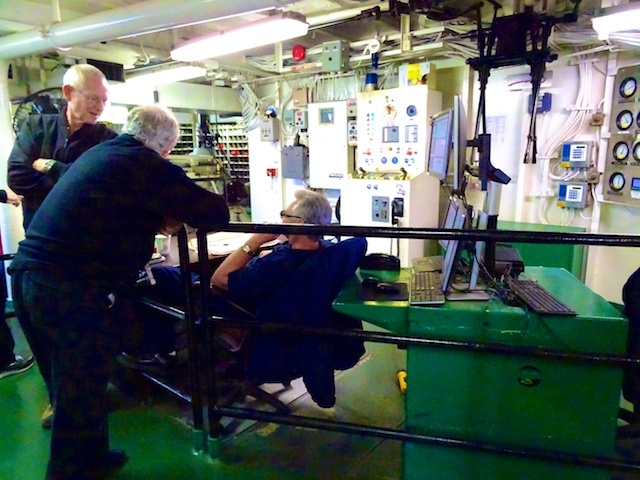 And the engine room where he and Rob had a chat to the engineer who explained that the controls were all computerised. He just sat and watched a monitor. So there is no need of a wheel anymore. However, there is one in the Chart Room but its only for show. The Chart Room had a staff member called a Riverlorian who could tell you anything you wanted to know about the boat and the river. Even though I am not American, I remember the famous speech Martin Luther King made on the steps of the Lincoln Memorial in Washington DC on 28/08/1963. I have been lucky enough to visit Washington DC and I have stood on the marker where Dr King made his speech. 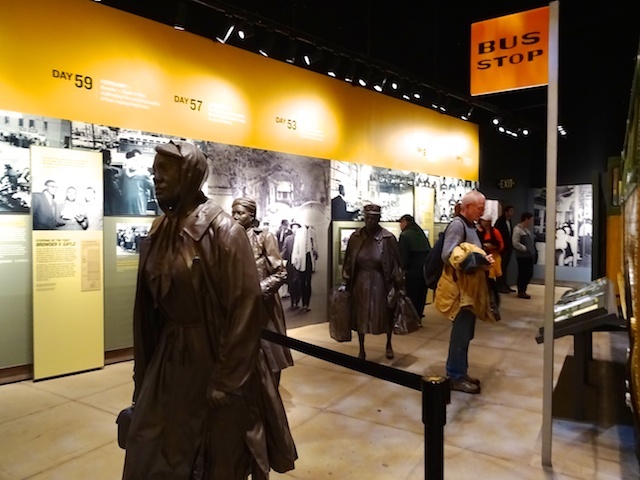 On our last trip to USA we visited the National Civil Rights Museum in Memphis, Tennessee. 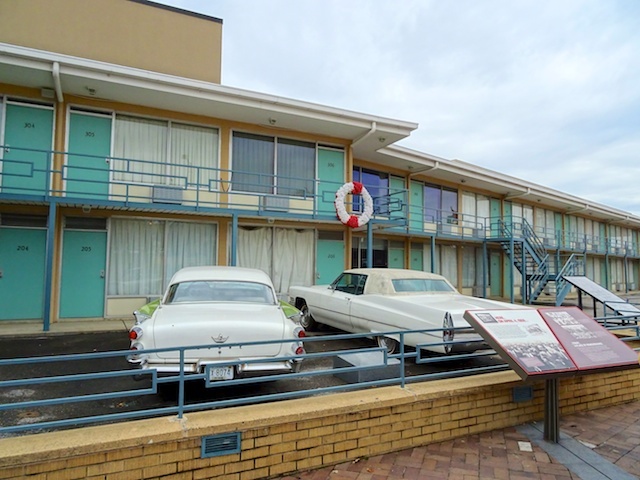 It is a fabulously, modern museum built around the Lorraine Motel where Martin Luther King was assassinated on 04/04/1968. The museum opened in 1991 and was renovated in 2014. It chronicles key episodes of the American Civil Rights Movement and the legacy of this movement. 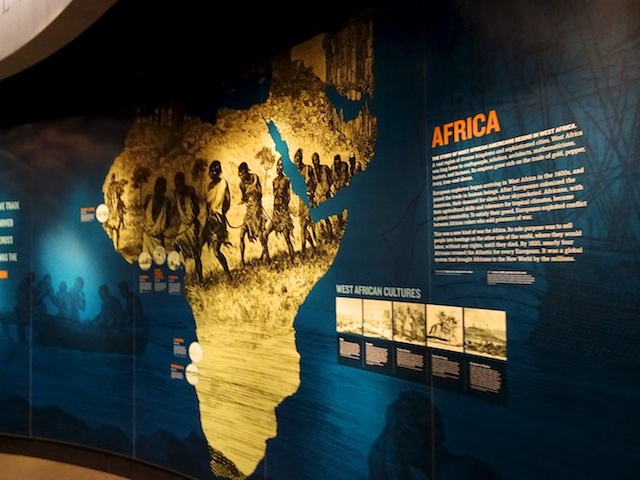 There are 33 different exhibits. They are shown in a variety of interactive media. You can't get bored and you can spend hours there. 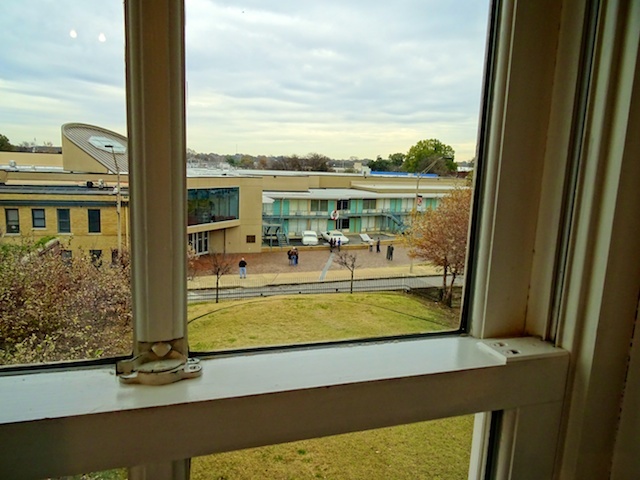 The National Civil Rights Museum is a big two story building attached to the original Lorraine Motel which is seen on the right and below. There is a wreath at the spot where Martin Luther King was shot. The cars are models of those times and the outside of the motel is unchanged. 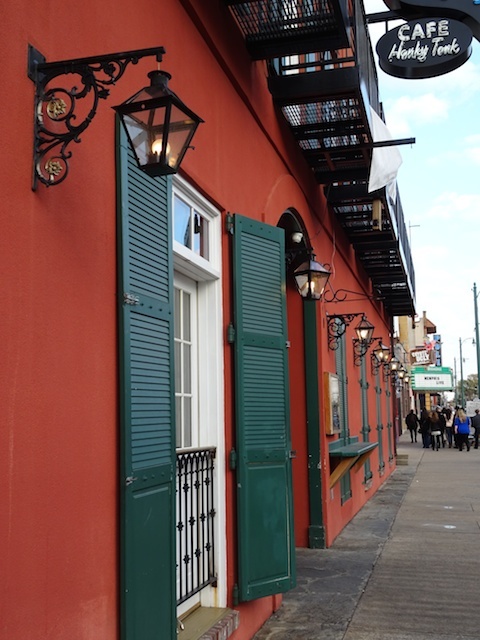 The rooms where King and his party were staying have also been left as they were. The rest houses exhibitions. You can do a self guided tour. It starts at the beginning when slaves were taken from Africa. There are pictures, sculptures, floor maps and videos. 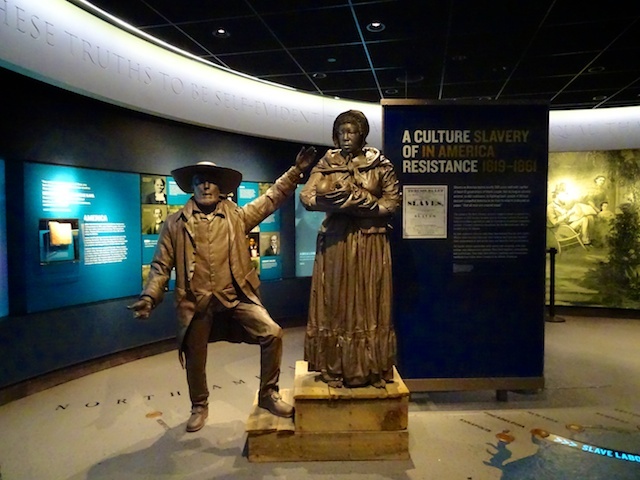 This sculpture depicts a trader selling slaves. 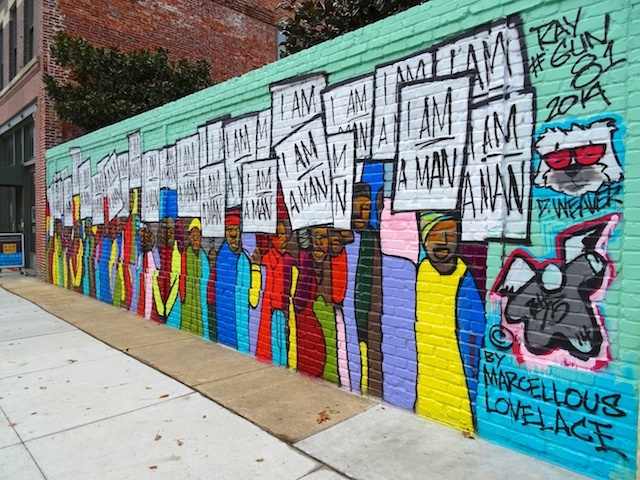 The fight for civil rights story continues on up to the present day. This area explained the incidents involved in getting the right to travel on any bus in any seat. Eradicating whites only areas.There were many life like sculptures of passengers. Across the road is the Legacy Building. There are three levels devoted to the assassination. 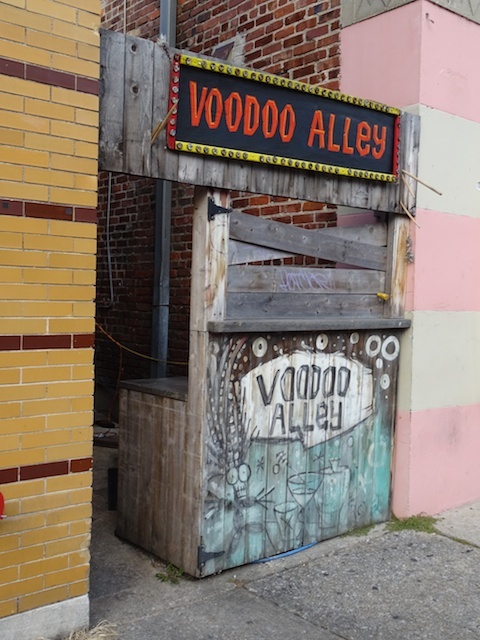 The Main Street Rooming House was the building where James Earl Ray fired the fatal shot from a window in a bathroom next to this one. The bathroom is left as it was, filthy. In the streets of Memphis there are still reminders of people declaring independence against oppression. Christmas is over. 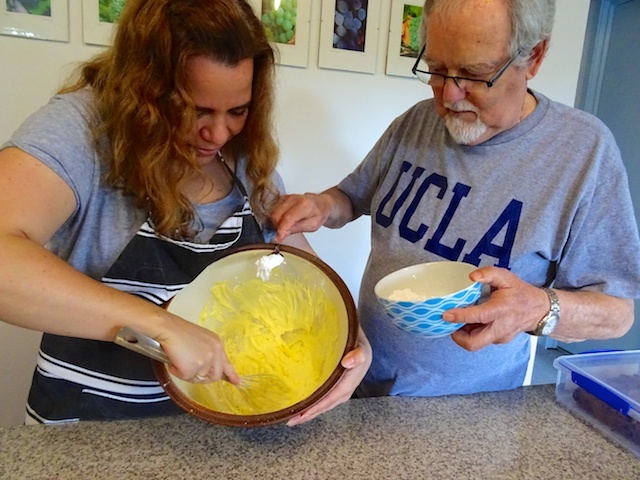 We had a great time with our eldest daughter, Carol-Ann and her husband, David. 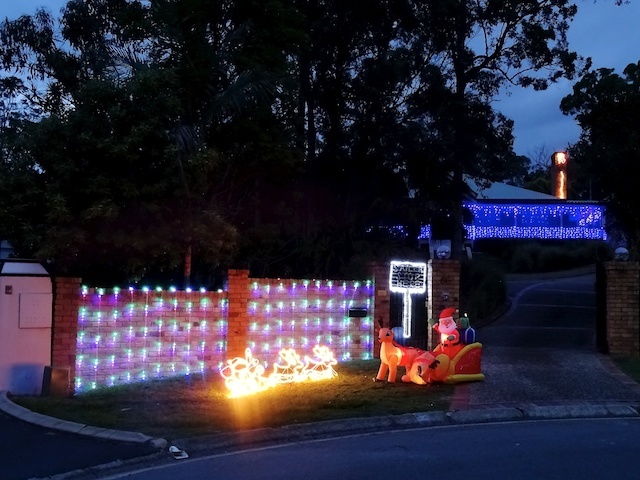 They had just completed their four month world tour and they were only home, in Sydney, for one day before flying here to be with us and David's parents for Christmas. 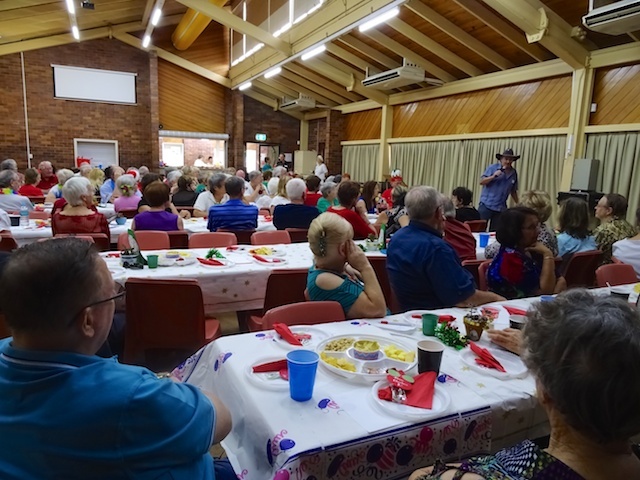 Unfortunately, Sonya, Bernie and the grandchildren couldn't make it from LA but Skype is good. 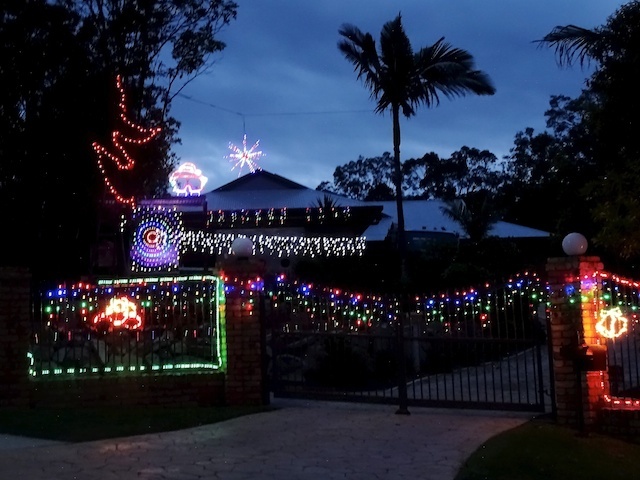 We went for a walk along our street to see our neighbour's Christmas lights. Too many to put all here. Ours were a bit subdued in comparison. Minimalist, I call it. 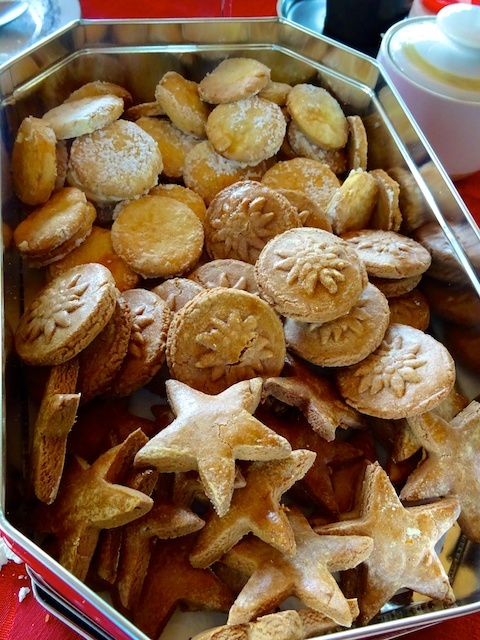 We celebrate Christmas on Christmas Eve like in Switzerland. 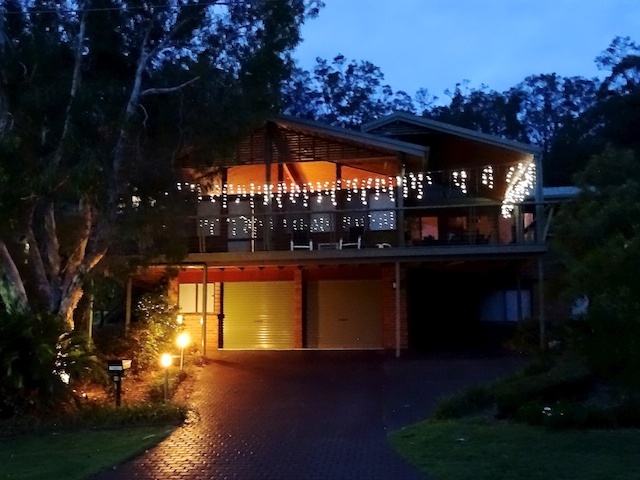 This is convenient for the young ones, who can then celebrate with their other parents on Christmas Day. 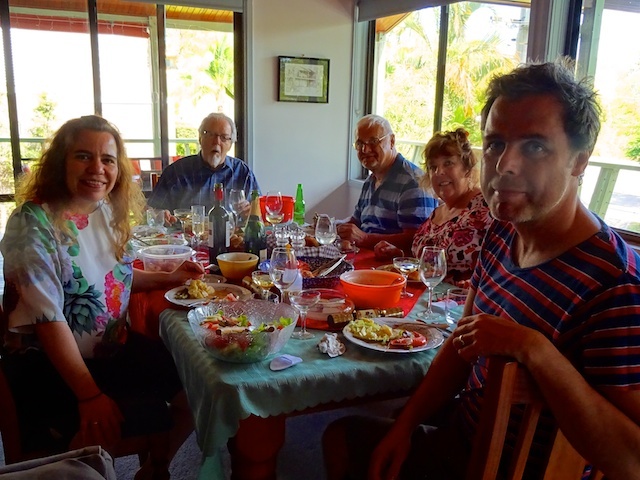 We had delicious seafood and salads, prawns, Morton Bay Bugs (similar to crayfish) and a big baked Snapper fish. We ate inside in the air-conditioning as the temperature was over 30°C, instead of on the deck as usual. 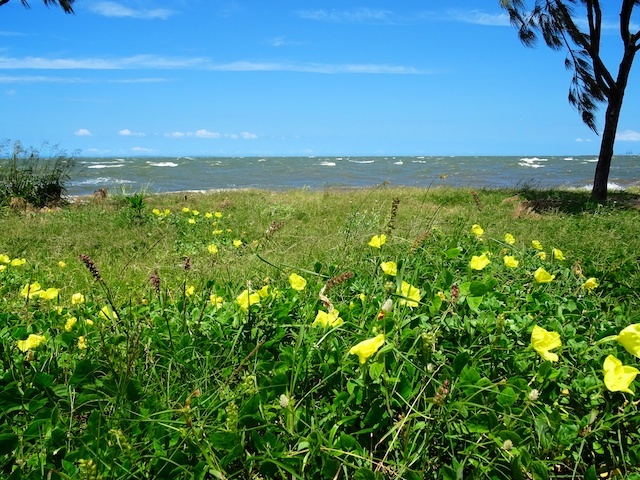 Carol and David found it very hot after spending a long time in the cold of the northern hemisphere. 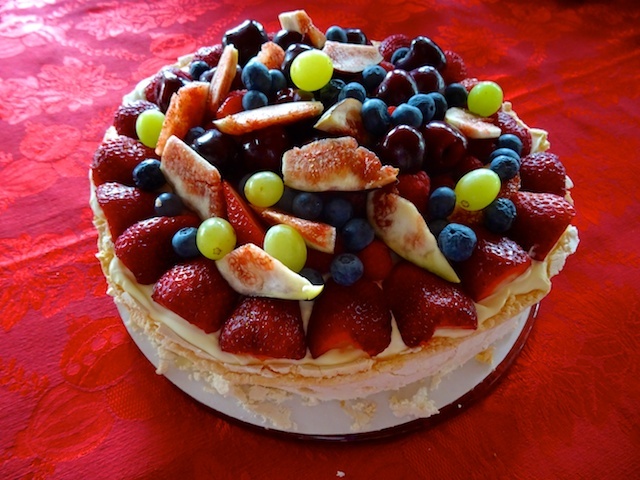 We had pavlova for desert. 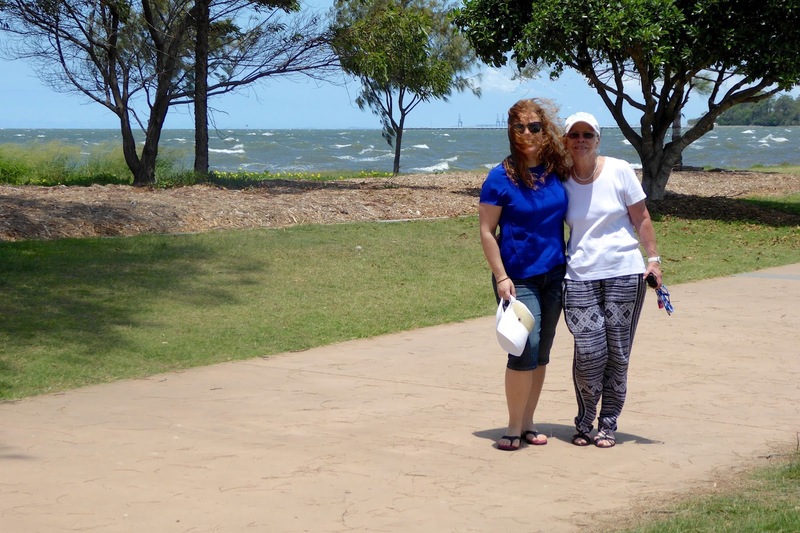 On Boxing Day we always visit David's parents and have morning tea on the Bayside followed by lunch at their house. 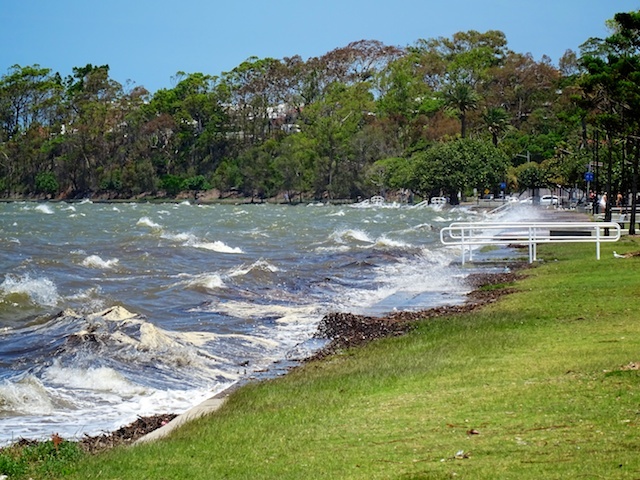 The tide was high and it was breezy. It is SO good to have Carol-Ann home for Christmas. After we arrived home from a holiday in USA we were straight into Party mode. 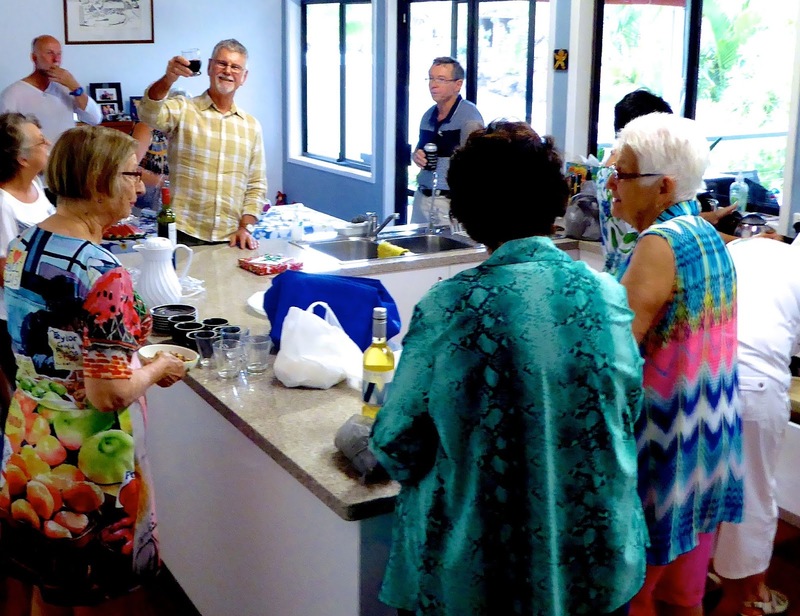 Firstly, through a jet lag haze, we hosted a camera Club lunch at our place. 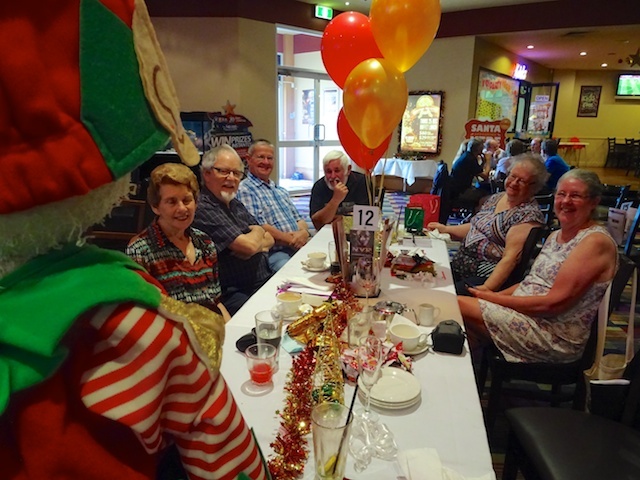 Then it was the Logan District U3A (University of the Third Age) Christmas Party. We had bush poets to entertain us as well as items from a few of the classes. 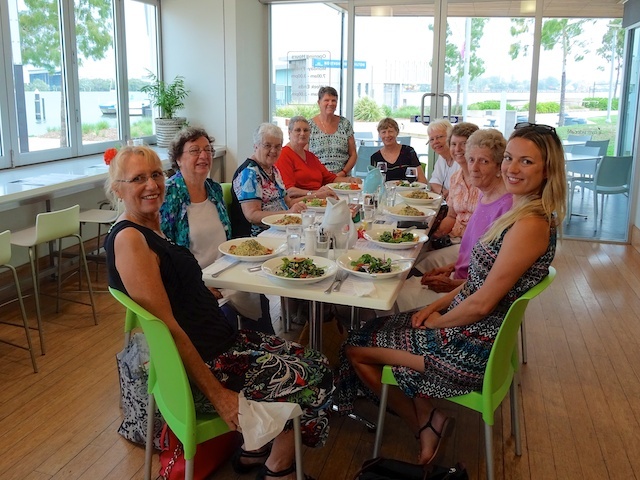 The very next day it was my tennis club lunch at Northshore on the river. 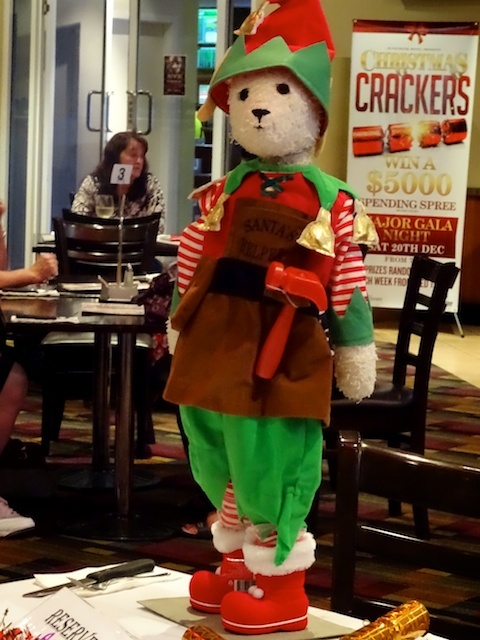 The day after that it was Christmas lunch with Birthday Bear and his friends at Sunnybank. Chris and Bob our Grey Nomad wanderers were close to Brisbane so it was great to have them join us again. Birthday Bear's blog friends, Jerry and Ben, are often asking what he has to eat and drink at our parties. 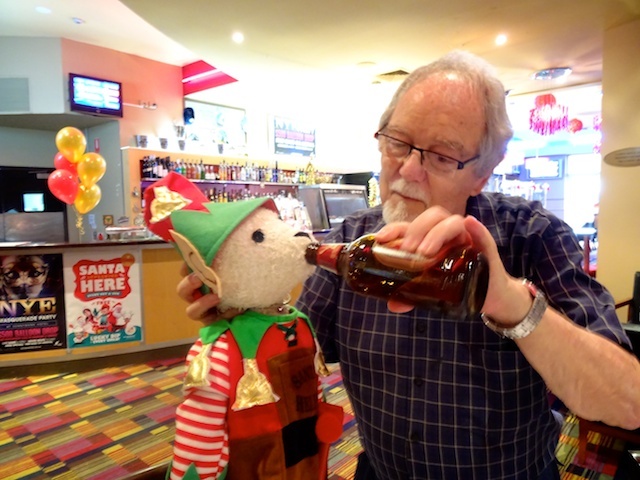 He sure is enjoying Bill's beer. 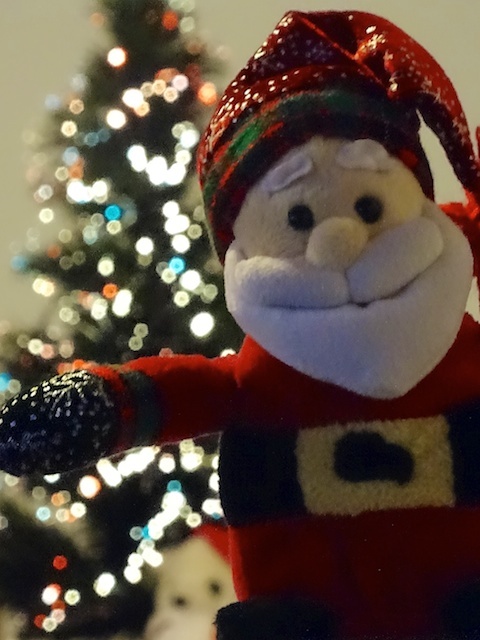 HAVE A MERRY CHRISTMAS EVERYONE!!!! 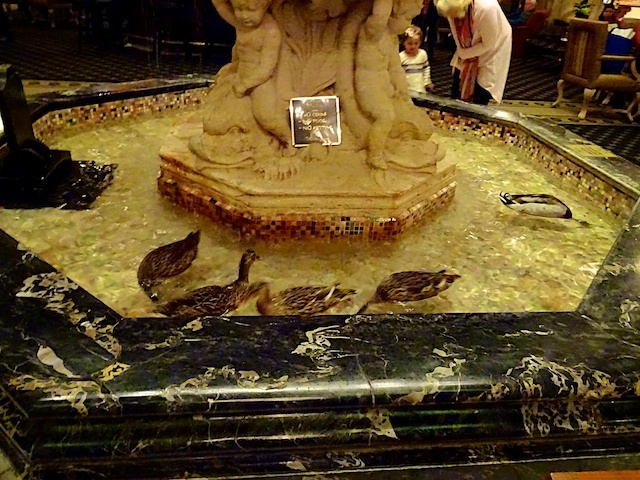 I once saw on TV an article about the "Peabody Ducks". 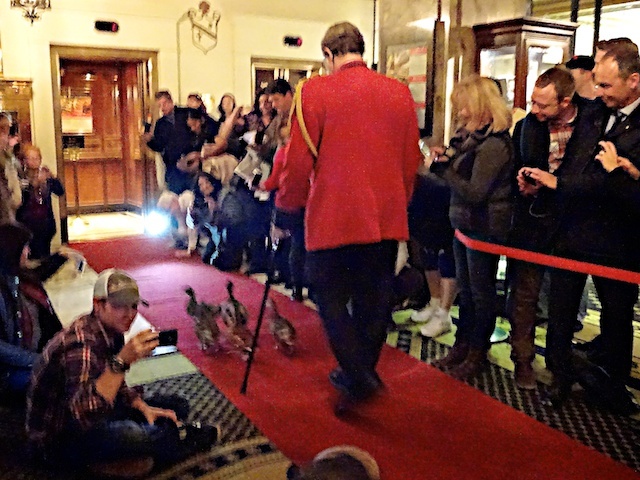 There are five ducks that live in the penthouse of the Peabody Hotel in Memphis, TN, USA. Everyday at 11:00am the ducks come down in the elevator to the foyer fountain and swim there until 5:00pm when they are marched back to the elevator on a special red carpet by the Duckmaster. 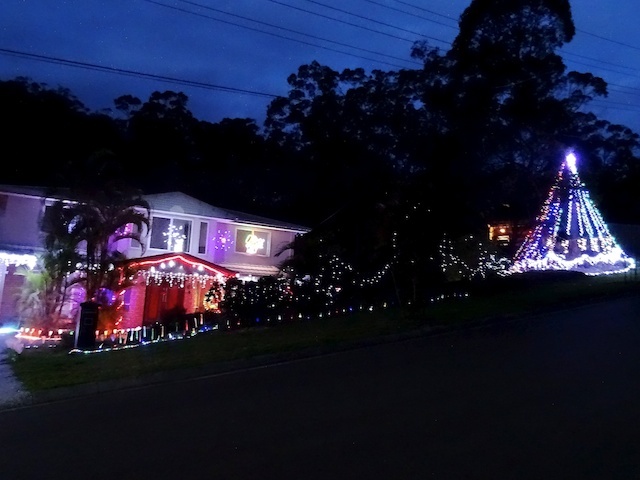 This tradition has been going for 80 years. 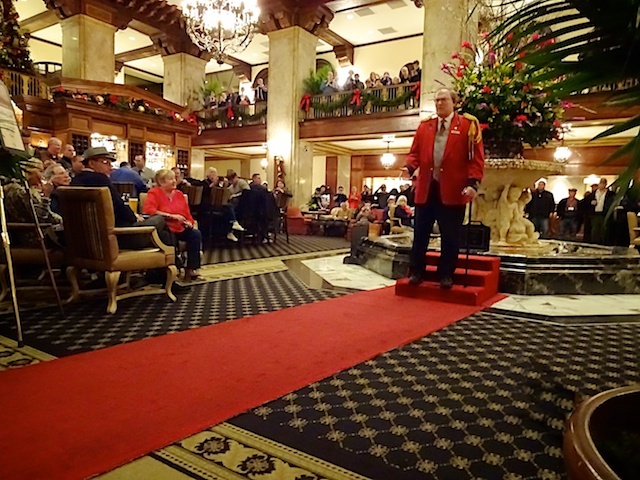 When we were in Memphis last month Bill and I thought it would be fun to see the march of the Peabody Ducks our friends Kathy and Rob were not so keen but we dragged them along anyway. They thought we were nuts wanting to wait with crowds of tourists to see ducks. 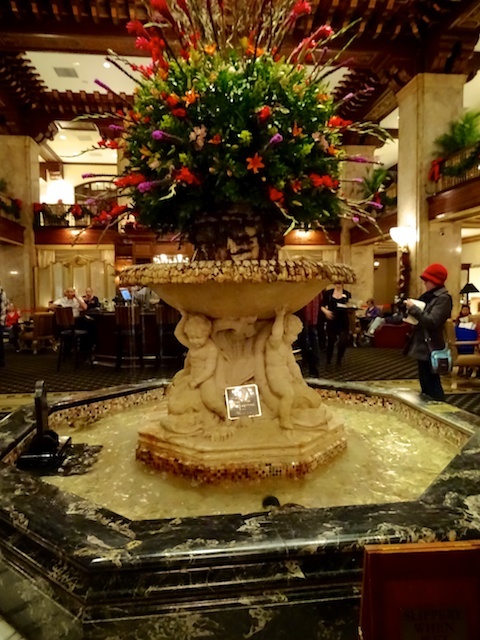 The fountain is cut from one enormous piece of travertine marble made and shipped from Italy for the opening of the hotel in 1925. The ducks are hiding behind the front edge. The flowers are changed every second day in the middle of the night. 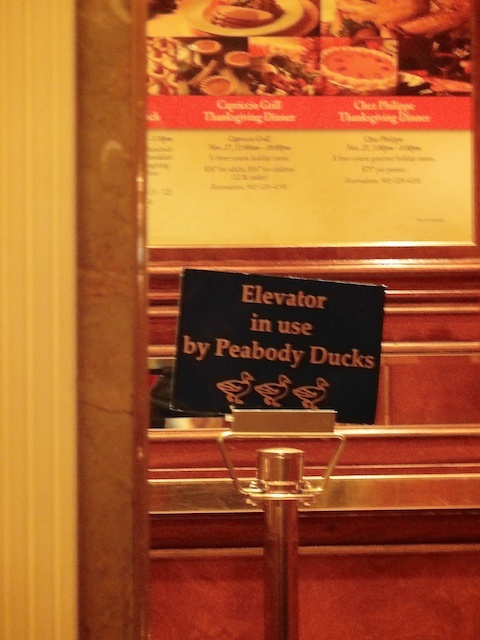 The elevator is stopped for guests and a sign placed inside saying 'Elevator in use by Peabody Ducks. Hundreds of tourists pour into the foyer as it gets close to five o'clock. There are four female and one male Mallard Ducks. They are raised by a local farmer and each team only live in the hotel for three months and then they return to the farm where they are free to live as wild ducks. After waiting for nearly an hour the Duckmaster (full of his own importance) proceeded to tell us the legend of the Peabody Ducks. Back in the thirties Frank Schutt, General Manager of the hotel and a friend returned from a hunting trip. The men had a little too much whiskey and thought it would be funny to put some of their live duck decoys in the beautiful fountain. They were an instant hit with guests so the ducks stayed. In 1940, bellman Edward Pembroke, a former circus animal trainer, offered to deliver the ducks to the fountain each day and taught them the now famous Peabody Duck March. He became the Peabody Duckmaster for the next 50 years. 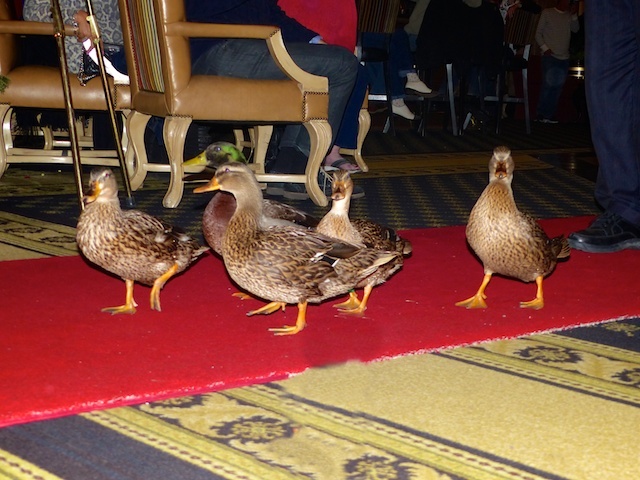 The marching music starts and the ducks march from the fountain to the lift on their red carpet. Into the lift and up to the Duck Palace on the roof. After the long wait for a few minutes action we decided to make the most of the visit and have dinner in the hotel. 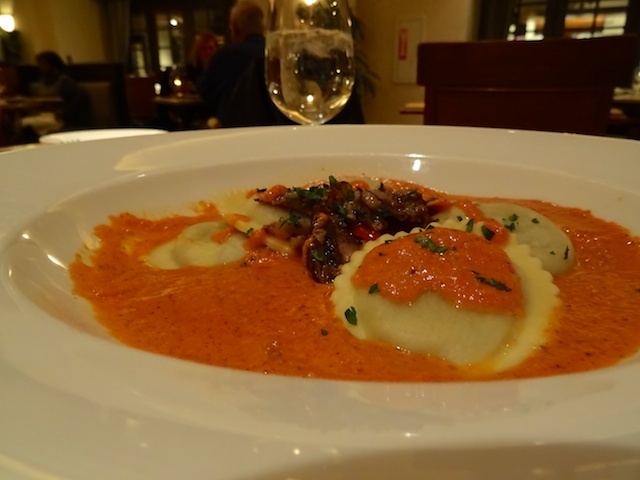 We found an Italian restaurant. 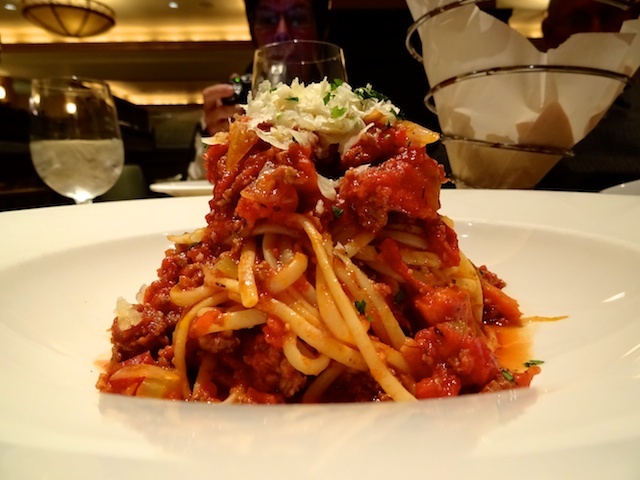 I had spaghetti bolognese. Kathy and Rob had Brisket. They don't serve duck at the Peabody Hotel. Back in 1909 Beale Street was the hub of the black community and Blues music. 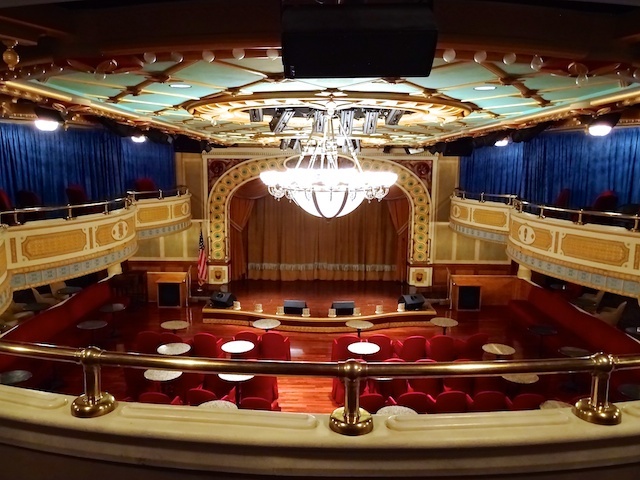 Every night club, dance hall, gambling den had a stage and live music. 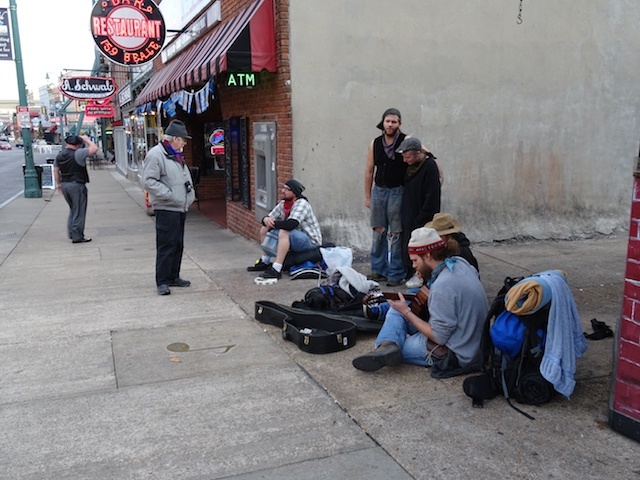 Every street corner had a jug band collecting pennies. 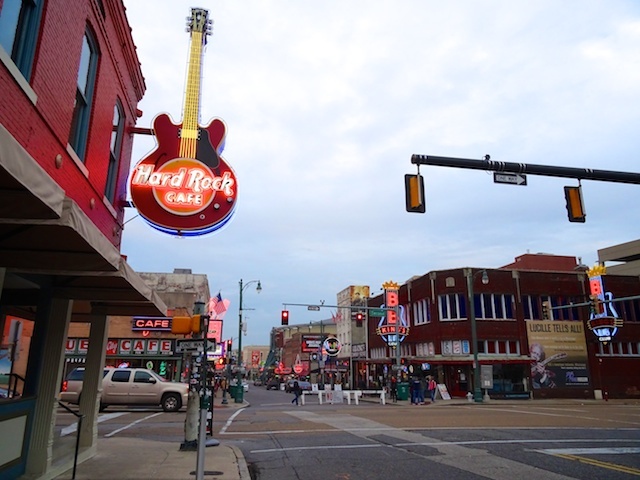 Beale St to musicians was like Broadway to actors. 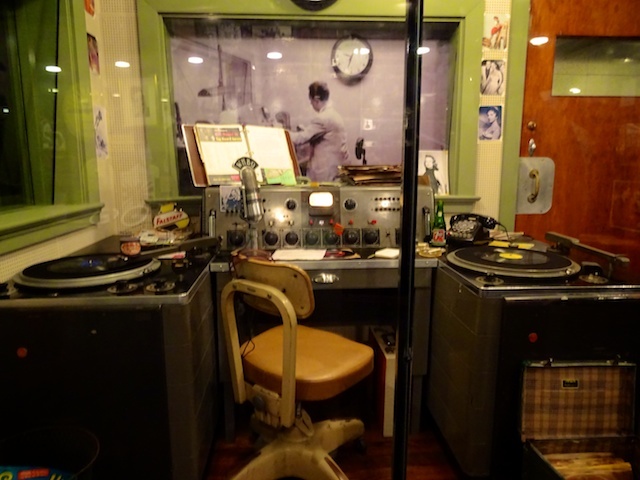 In the 50's Sam Phillips started recording the music at Sun Studios and he was instrumental in the birth of Rock 'n Roll. Beale Street was alive with music again. 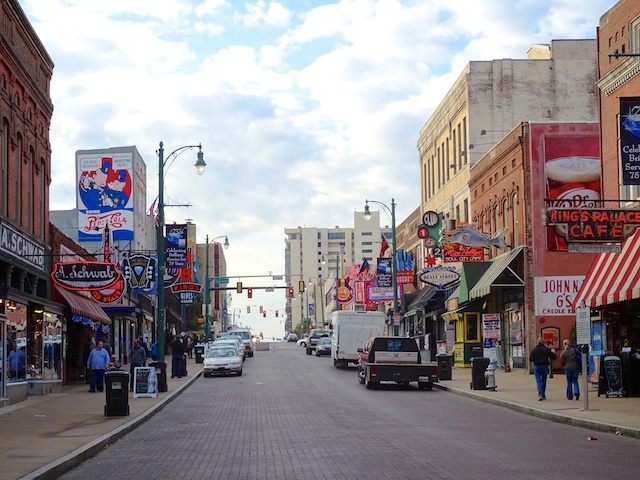 Even though there is still music coming from the bars and the street is blocked off at night for entertainers, Beale Street is looking tired and grotty. It is like a living museum of earlier dynamic times. However, we enjoyed strolling up and down the famous street. Bill chats to some buskers. It was hard to decide which bar/restaurant to go in for lunch. One of the few buildings looking clean and tidy. More were like this, boarded up and run down. In the evening we found a Hop on Hop off bus stop but after waiting a long time none came at the time displayed. So we walked a few blocks and caught a regular bus back to the hotel for $1. Bill was keen to visit Sun Studios while we were in Memphis, not that he was a Rock'n Roll fan but he is very interested in the history of recording music. This building is no longer a recording studio but a museum. The new studios are built behind. We went on an interesting guided tour of the studio as it was back in the 50's. 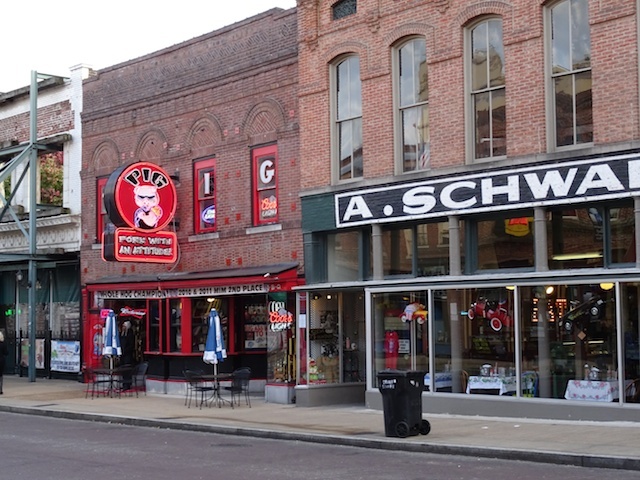 It is where Elvis as a teenager paid $4:00 dollars for Sam Phillips to record a song, with hopes of being asked back. It took a year before he was invited to play with the studio band. Sam still wasn't happy with Elvis until he heard him messing around in a break. He recorded "That's All Right" it was blues like he had never heard before. Rock'n Roll was born. The museum rescued this WDIA radio studio from a building being gutted. 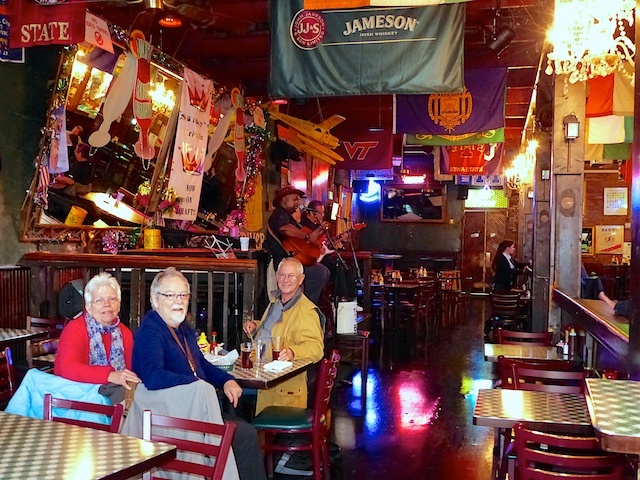 It was where the famous DJ Dewey Phillips played many blues songs and became a teenage idol. 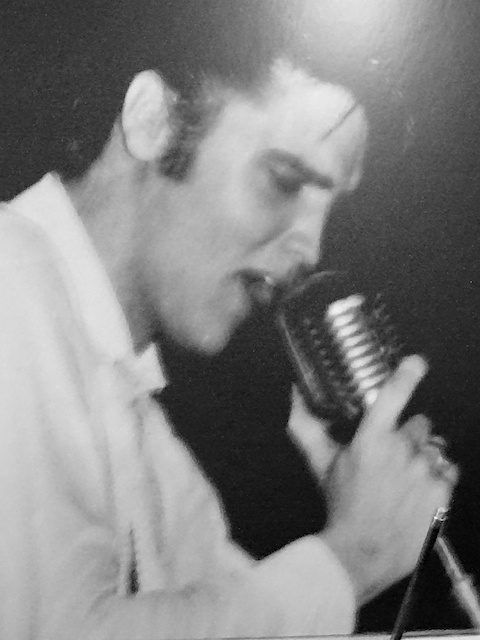 He was the first DJ to play a song recorded by an unknown teenager named Elvis Presley. The Sun recording studio is just as it was back in the 50's. 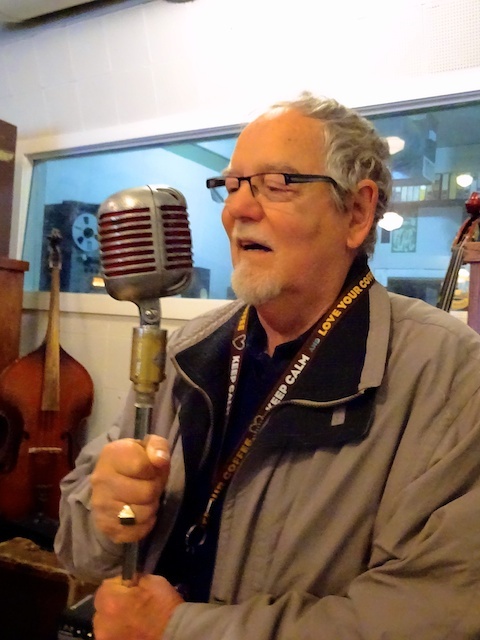 They still have the mike that Elvis used and visitors are allowed to touch it, which is unusual for a museum. But Bill enjoyed having a go. 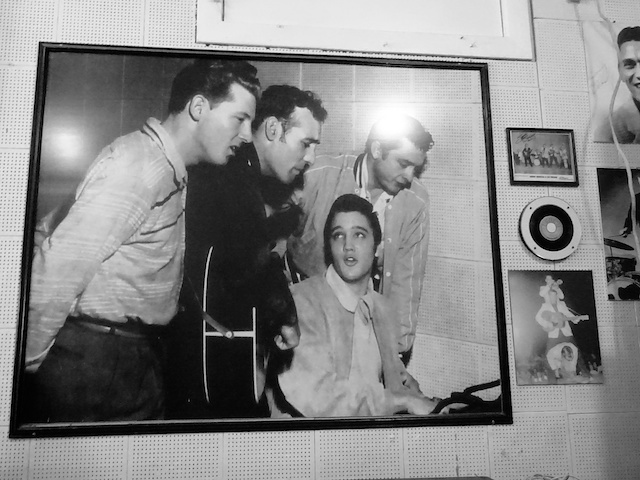 There is a history of the recording artists in pictures around the walls of the studio. 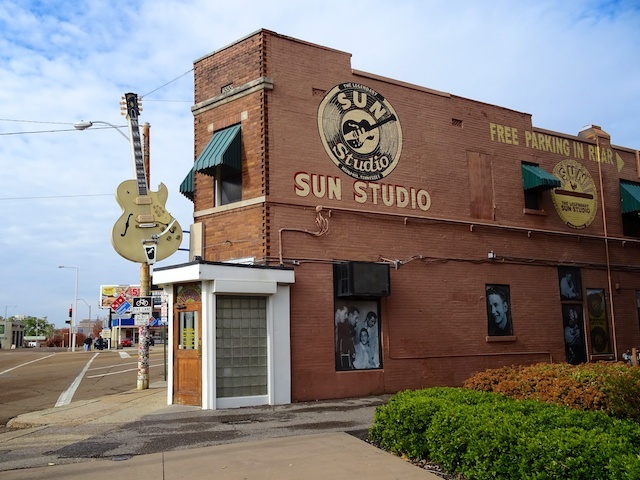 Sun Studio was responsible for making Elvis, Johnny Cash, Jerry Lee Lewis and Carl Perkins famous. They were all poor kids when that started. One day the four of them turned up at the studio together and had a jam session. The photo is called "The Million Dollar Quartet". It was an interesting trip down memory lane. CADES COVE, SMOKY MNTS NATIONAL PARK.